A newborn baby has died after being discovered under the body of his dead mother in a maternity hospital room. 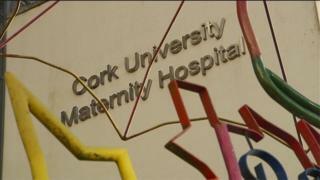 The mother, who was in her 30s, and her baby boy were found on the floor of the single room at Cork University Maternity Hospital (CUMH) on Monday morning. Medical staff are understood to have made the discovery during ward checks just before 08:00 local time. The baby, who was given emergency treatment, died on Tuesday evening. It is believed the mother may have trapped her infant beneath her after falling from the bed during a a medical episode while breast feeding. Post-mortem examinations will be carried out on the mother and baby. The South/South West Hospital Group described the deaths as a "tragic occurrence" and said an investigation had been launched. "South/South West Hospital Group wishes to confirm that a baby boy passed away at Cork University Maternity Hospital last evening (Tuesday)," said a spokesperson. "The mother of the four day old infant died at the hospital on Monday morning. "As with all unexplained deaths, a full medical investigation was immediately initiated. "CUMH wishes to express its deepest sympathy with the family of the mother and her baby. The priority now for the hospital is the well-being of their family."